Small business owners looking for an easy way to earn cash back without juggling rotating category rewards. This card allows users to earn unlimited 1.5% cash back on all purchases with no annual fee - those savings can be lifesaving for a new small business. See our other top business credit cards. 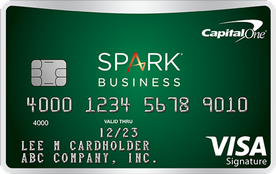 Our take: The Spark Cash Select from Capital One is a good no-fee business credit card that doles out 1.5 percent cash back for every dollar you spend.